Sherry fino--perfect with Spanish tapas. It’s World Sherry Day tomorrow! What better excuse to enjoy this unique wine? At my house, not only am I sipping Sherry, but I’m cooking with it too (recipe for Chicken With Sherry is below). We're talking about Sherry with a capital “S”. 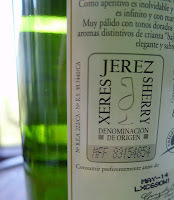 That's "S" as in Jerez, a town in southern Spain where this extraordinary wine is made. 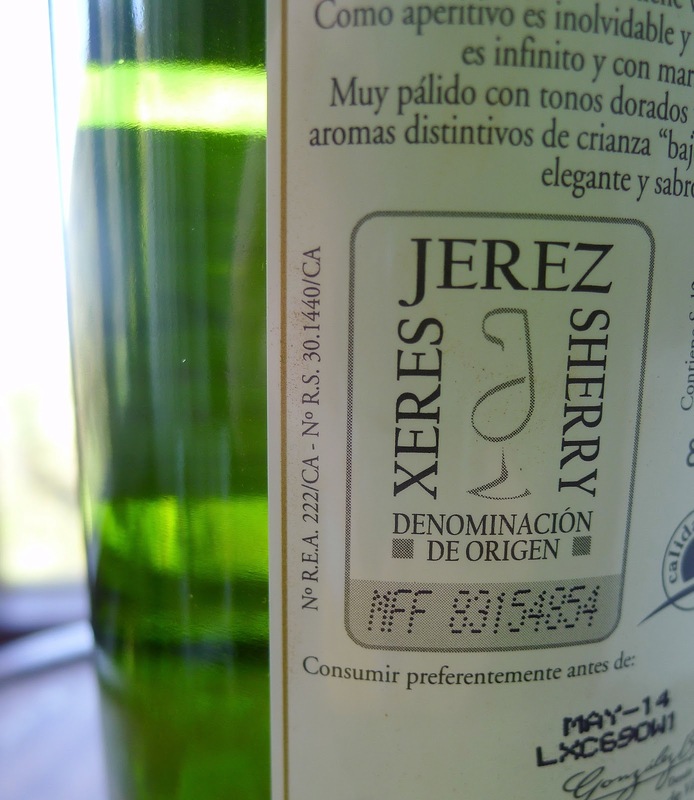 In Spanish, Jerez is pronounced "hare-ez." But, if you were an Englishman or Frenchman and attempted to pronounce the town’s name, it might come out as “sherez.” Forget anything you ever heard about lower-case "sherry" from Britain, Australia or California. It's not Sherry—any more than does Port come from any place but Oporto; Burgundy or Champagne from anywhere but those regions of France. Jerez de la Frontera, in the province of Cádiz, is Sherry's home base, where most of the long-established bodegas, or wineries, are located. 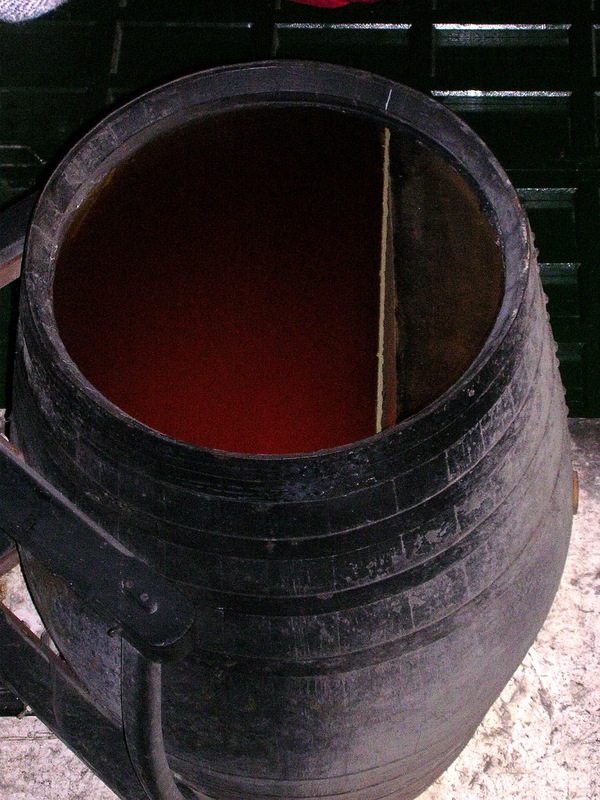 Two other towns in the region—El Puerto de Santa María and Sanlucar de Barrameda—are also authorized Sherry producers. The grapes must be produced within a 35-kilometre radius. Real Sherry is made from the Palomino grape varietal. Sherry is made by a very special process, called criadera, meaning “nursery.” New wine is added to casks at the top and gradually blended with older wines in lower barrels, before being drawn off from the bottom rack, the solera. This blending and aging process gives the wines depth and richness of flavor and aroma. Sherry is a fortified wine, with a higher degree of alcohol (16 to 19 percent) than most table wines. And, Sherry is the reason that tapas exist. 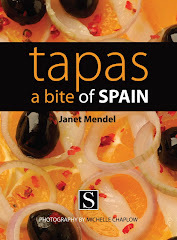 Tapas and Sherry create a perfect symbiosis, as bites of food make it possible to keep sipping the wine. You eat in order to better drink. Sherry with a capital “S” is further designated with lower-case names which describe the type of wine. Here they are, along with some suggestions for serving them and for using them in cooking. Barrel is lit to show flor on fino Sherry. Fino. After fermentation, new wine which shows the beginnings of flor, a veil of yeast, is classified as fino. During the aging process, the flor prevents oxidation, making a wine which is pale straw in color, totally dry, light and fresh, with an almondy finish. It is the world's finest aperitif wine. 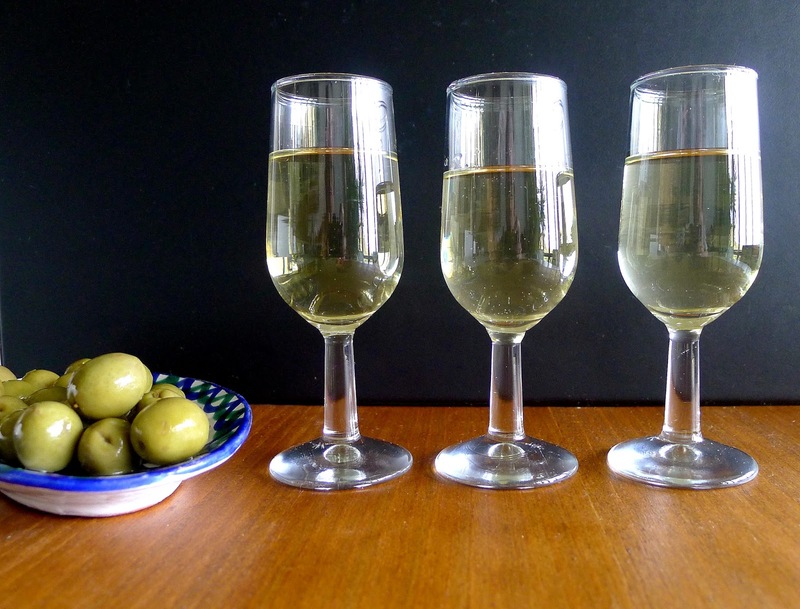 Serve fino, lightly chilled, with shellfish, ham, olives, toasted almonds or almost any of the many Spanish tapas. 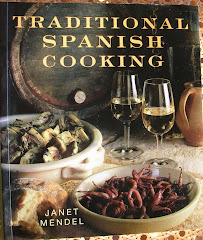 In cooking, fino Sherry combines with fish, shellfish, soups, chicken, meat, poultry, cheese and a large etcetera. 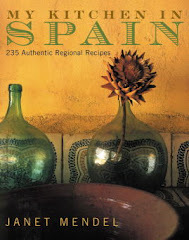 Classic dishes such as riñones al jerez, kidneys in Sherry, are made with a dry fino. 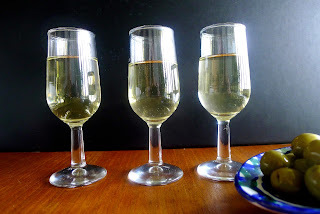 Which is not to say you can't create a new taste by substituting a different Sherry. Usually the Sherry is added during cooking, so the flavor blends with the sauce and the alcohol is cooked off. Sometimes the wine is added at the very end of cooking, so the volatile alcohol helps waft the wine's aroma to the nose and taste buds. 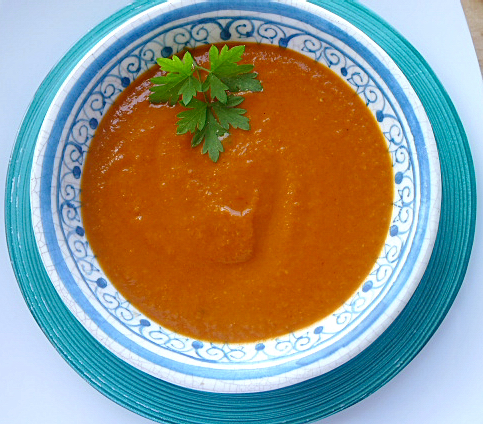 In the case of a soup or sauce, add some wine during cooking and a dash more at the end of cooking. Manzanilla. This is also a fino, but specifically from the Atlantic town of Sanlucar de Barrameda. Salt-air breezes and ocean humidity make this wine a little paler, a little drier, a little more delicate than other finos. Manzanilla, with its salty, olive tang, goes especially well with fish and shellfish. 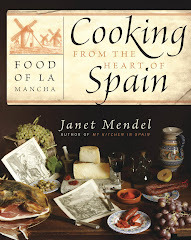 In cooking, add a splash of manzanilla at the very end of cooking, so the alcohol is not dissipated. Blend it with mayonnaise and seafood dressings. Amontillado. These are dry fino Sherries that are allowed a degree of oxidation during the aging process, giving them a rich, mellow, hazelnut flavor. Between topaz and amber in color, amontillado wines are still aperitif drinks. 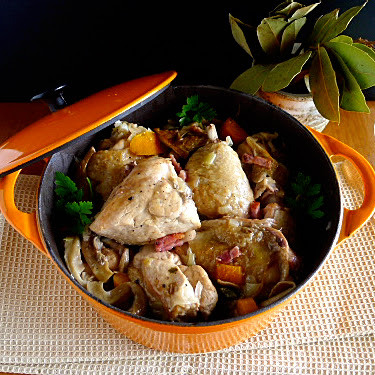 Their depth of flavor makes them superb additions to many dishes, especially meat and poultry. Add to cream of mushroom, asparagus, chicken and other soups. Combine with cheese for dips and spreads. Incidentally, amontillado means "in the Montilla style". Briefly, so as not to confuse the issue too much, wines of Montilla-Moriles are made in the province of Córdoba by the same process as Sherry, the criadera-solera system. Different grape varietals and different soil and climate produce wines which are at the same time similar to and completely different from Sherry. Or, anyway, much more like Sherry than one of those "lower case" wines from another country. Oloroso. Wines not marked with flor become oloroso. But within this designation are several styles, ranging from dry to almost sweet. Their color is deep old-gold, the mellow flavor is reminiscent of walnuts. Serve oloroso as an aperitif with Spanish sausage, with aged cheeses. It is a sumptuous accompaniment to after-dinner savories and the fruit and cheese board. This wine is especially rich in cooking. Add it to chicken dishes, poultry stuffing, organ meats, consommé. Within this category, rayas, palos cortados and olorosos secos present a range of styles. Use oloroso seco to lace a classic consommé. Cream. Mahogany in color, velvet in texture, these wines are made of a combination of mellow olorosos and sweet wines from the Pedro Ximénez grape varietal. An exquisite dessert wine. Use it to macerate fruit or add to dessert sauces. It gives a complex sweetness which complements some savory dishes when balanced with tart flavors such as orange, lemon, rhubarb. Try it for a new twist on duck á la orange. For some suggestions for cocktails made with Sherry, see this blog post. Chicken simmers in Sherry with mushrooms. Any type of mushroom works in this recipe. I used oyster mushrooms, torn into strips, for the version pictured here. Pour fino Sherry to accompany the meal. Sprinkle the chicken pieces with salt and pepper. Heat the pancetta and oil in a deep skillet, cazuela or heavy pot. Brown the chicken pieces on all sides and remove them. Add the onion, garlic, carrot and mushrooms. Sauté on a medium-high heat until the onions and mushrooms are slightly browned. Stir in the flour. Add the Sherry to the pot and stir to combine the ingredients. Return the chicken pieces to the pot. Stir in the stock, bay leaves, orange zest, half of the parsley and salt and pepper. Bring the liquid to a boil, then reduce heat and simmer, covered, 30 minutes. 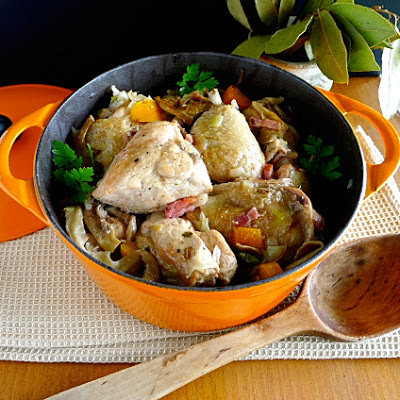 Turn the chicken pieces and cook until tender, about 30 minutes longer. Remove bay leaves and orange zest. Garnish the chicken with additional chopped parsley. 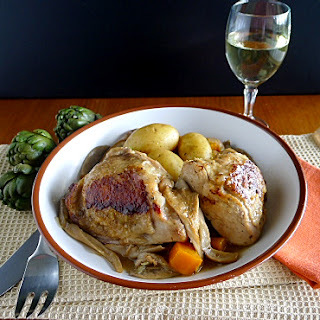 Dinner is served--tender chicken braised in Sherry. Sip Sherry with the meal too. Shrimp and garlic sizzle in oil. First you catch a tantalizing whiff of garlic. Then, as the cazuelita is set before you, you feel the heat radiating from the little dish. The lid is lifted and the oil spits and splutters. Small pink shrimp, golden slices of garlic and deep red flecks of chili dance in the oil. Now a taste—don’t burn your tongue! 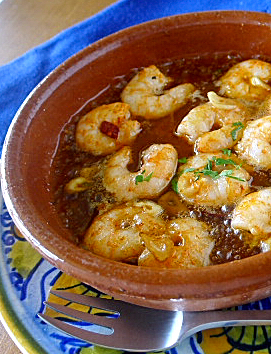 Gambas al ajillo—shrimp sizzled with garlic— this is the essence of the tapa bar sensory experience. 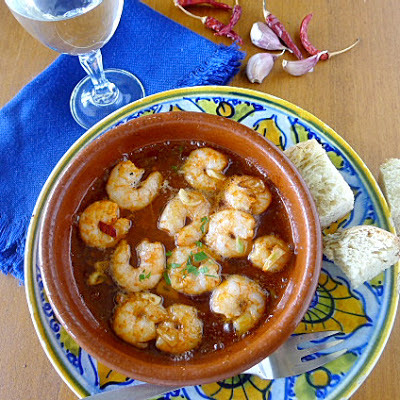 In bars in Andalusia, this tapa is known as gambas al pil pil, for the onomatopoeia of spitting oil. But Madrileños look askance at such nomenclature, seeing as how “pil pil” in Basque cuisine is something quite different (an emulsified sauce for salt cod, with olive oil and garlic). 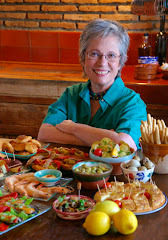 In tapa bars, the dish is prepared to order in small, individual cazuelitas, earthenware ramekins. You can do this in a home kitchen by placing the individual ramekins directly over gas burners. If using earthenware, remember that it retains heat, so remove the shrimp from the stove before they are fully cooked. If you have an electric stove, you will need to use a heat diffuser under clay cazuelas or else use a metal pan instead of clay. If you don’t want to bother with individual servings, cook all the shrimp in a skillet, then plate them. While they won’t have quite the same sizzle, they will still taste divine! This dish packs a lot of flavor for just four ingredients—shrimp, olive oil, garlic and a few flecks of hot chili. The juices from the shrimp flavor the oil, creating a sauce for dipping chunks of bread. 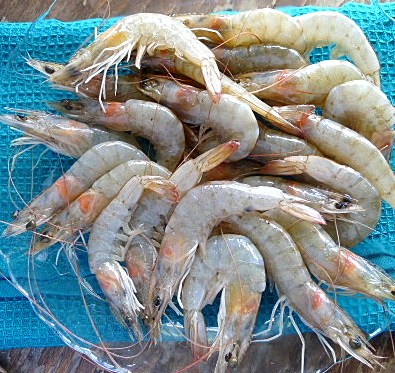 It’s best made with whole fresh shrimp, peeled shortly before cooking. However, not everyone can get them fresh, so frozen is an alternative. Incidentally, you and I say “shrimp,” no matter what the size of the crustacean (unless you’re a Brit, in which case you call it “prawn”), but Spaniards have names for every variety. So, in fact, the ones pictured here are not “gambas,” but “langostinos.” That's because the gambas at the market today were very small indeed. 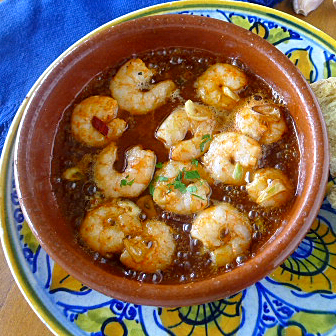 Why are gambas al ajillo usually depicted as jumbo shrimp with their tails intact? Maybe food stylists think they’re prettier with unpeeled tails aloft. In fact, this dish is usually made with small to medium shrimp and always with the whole shrimp peeled, tails as well. No way are you going to use your fingers to pick them out of the boiling oil. They’re meant to be speared with a fork or toothpick and eaten in one bite, with bread for sopping up the juices. 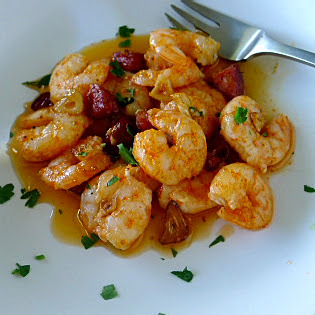 Variations on a theme: Add a splash of manzanilla Sherry to the shrimp. Or, add chopped serrano ham or chopped chorizo along with the sliced garlic. Shrimp sizzled with chorizo, plated. If making individual servings, place 2 tablespoons of oil in each of 4 cazuelitas or small pans. Divide the garlic, chili and shrimp between them. Otherwise, place the oil in a skillet with the sliced garlic and chili. Heat until the garlic begins to turn golden. Add the shrimp in a single layer. Cook them, stirring, until they turn pink, 30 to 40 seconds. Add the Sherry, if using, and cook 1 minute. Remove the pan from the heat. Sprinkle with parsley and salt. Spoon the shrimp, garlic and juices into 4 individual ramekins or plates. Serve with bread. Patatas bravas--golden cubes of fried potatoes with a spicy sauce. These are “hot” potatoes. Hot, as in spicy. 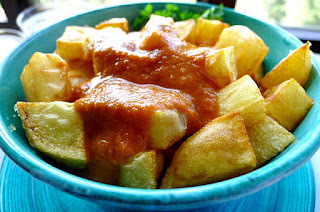 Cubes of potatoes are fried until golden and served accompanied by salsa brava, a chile-spiked sauce. 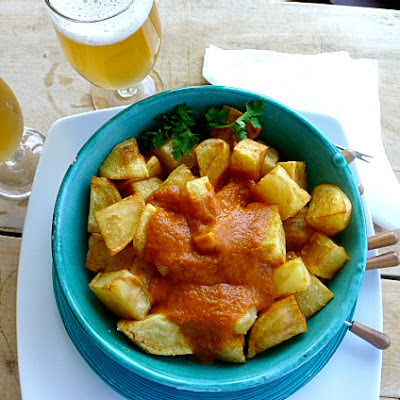 They are the patatas bravas that supposedly originated in the Madrid tapa bar, Café Brava, but are crazy popular in tapa bars all over the country. No one “authentic” version seems to exist. Every bar has a “secret” way. Most versions of salsa brava are basically a smooth tomato sauce with enough cayenne or Tabasco to add heat. Others contain no tomato whatsoever, but are ruddy-red with pimentón, both sweet and hot. The sauce should be about the consistency of ketchup. Some bars serve the potatoes with both the brava sauce and alioli, pungent garlic mayonnaise (recipe ). As for frying the potatoes. Olive oil, preferably extra virgin, is the best frying medium. Yes, really. Not your most expensive olive oil, as it loses its prized organoleptic characteristics at higher temperatures. But any good supermarket olive oil is fine for frying. Add oil to the skillet to a depth of about ¾ inch. The quantity of oil depends on the size of the skillet. Heat olive oil until shimmering, but not smoking. If you have a frying thermometer, that is between 350º and 360º F (180ºC). Fry the potatoes in small batches, never crowding the skillet. Carefully turn the potatoes in the bubbling oil. A crust forms on the potato cubes so the oil doesn’t penetrate, but they don’t brown too quickly. This way the interior of the potatoes cooks thoroughly. Then reduce the heat to medium and continue frying until a potato cube when tested is tender (about 6 minutes). The potatoes will not be browned yet. Either raise the heat again to high and fry them until golden. Or, skim them out of the oil onto paper towels. Shortly before serving, heat the oil again until shimmering-hot. Add the potatoes and fry until golden. 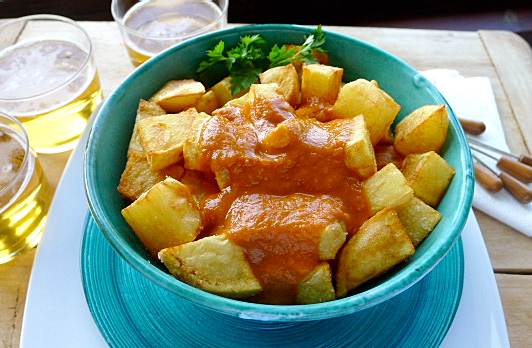 Serve patatas bravas with beer. Pimentón picante is spicy-hot paprika. If not available, substitute a pinch of cayenne. For the sweet pimentón, use either ordinary sweet paprika or smoked pimentón de la Vera. Makes about 1 ½ cups of sauce. Cut out stem ends of the tomatoes. Cut a slit in the skin of each and place them in a microwave on high for 1 minute. Turn the tomatoes and microwave 1 minute more. Allow the tomatoes to cool. Slip off the skins and break up the tomatoes, saving the juice. There should be about 1 ¼ cups of pulp and juice. Heat the oil in a heavy pan and sauté the onions and garlic until softened, about 3 minutes. Remove from heat and stir in the sweet and hot pimentón, cumin and salt. Return to the heat and add the tomatoes. Cook, stirring, 2 minutes. Allow the mixture to cool slightly, then purée it in a blender with the flour, water and vinegar. Sieve the sauce and return it to the pan. Cook, stirring, until the sauce begins to bubble. Simmer for 5 minutes. Remove from heat. The sauce will thicken somewhat as it cools. It can be stored, refrigerated, for several days, but bring to room temperature before serving. Peel the potatoes and cut them in cubes of more or less 1 inch. If preparing the potatoes in advance, cover them with water so they don’t darken. Heat oil to a depth of ¾ inch. Drain the potatoes of water and pat them dry on paper towels. Fry them in batches in hot oil, as described above, until tender on the inside and golden on the outside. Skim out the potatoes onto paper towels. Sprinkle with salt immediately. Serve the potatoes in a bowl with the sauce dribbled on top. Sprinkle with chopped parsley. Patatas bravas, a favorite tapa dish. Fresh strawberries with luscious natillas custard. Are you bored with plain old strawberries and cream? Here’s a luscious alternative to whipped cream—natillas. Natillas (yes, it is singular) is a creamy custard that can be poured over fresh berries. 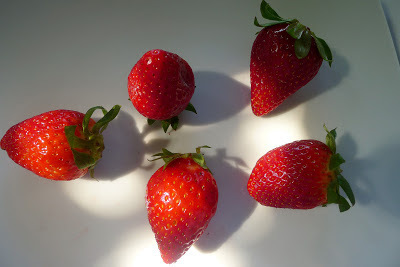 Most of Spain’s strawberries are grown in the province of Huelva the southwest corner of Spain, bordering Portugal. Huelva is Europe’s largest producer of strawberries (about 275,000 tons), with about 85 percent of the crop being exported. Strawberries from Huelva—known as fresa or fresón, meaning "great big strawberry"—are gorgeous red berries, fragrant and sweet. Natillas is a simple homemade pudding, typical in rural areas where fresh milk and eggs are plentiful. 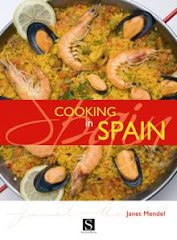 In La Mancha it is made with warmed sheep’s milk (Manchego cheese is a sheep’s milk cheese) that is thickened with egg. The custard is poured over tortas, sponge cookies, somewhat like ladyfingers, then sprinkled with sugar and cinnamon. 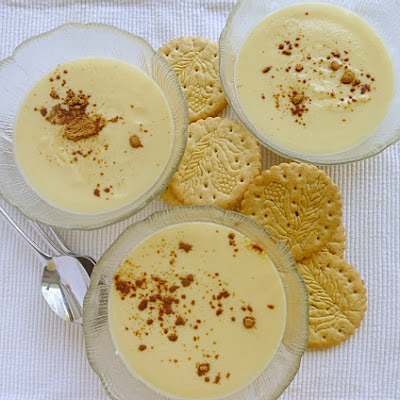 In Andalusia natillas is made with goat’s milk and served with crispy galletas, plain cookies. Commercial natillas, a favorite store-bought dessert for kids, may not contain eggs at all, but is thickened with cornstarch. Natillas traditionally is flavored with lemon and cinnamon. However, the milk can be infused with alternative flavors—vanilla bean; orange zest and rosemary; mint. Vanilla custard is particularly good finished with a dribble of chocolate sauce instead of the sprinkled cinnamon. 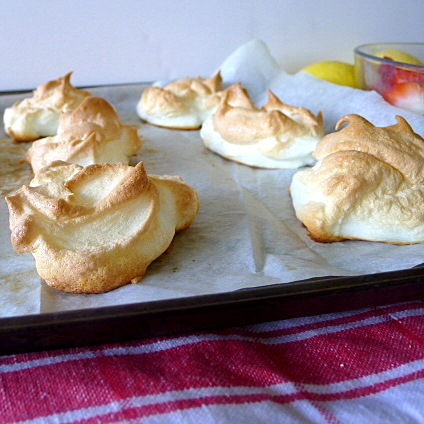 Use egg whites to make meringues. What to do with all those egg whites? 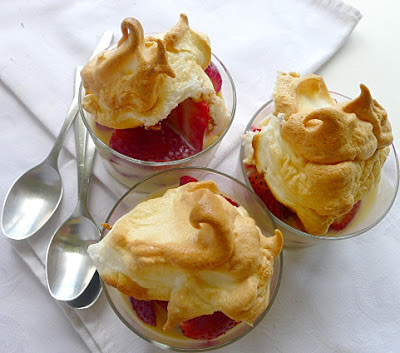 Make meringue toppings to serve with the natillas. Cook the custard in a double-boiler over boiling water, as direct heat is likely to scramble the egg yolks before they thicken. If the custard is to be served with fresh berries, let it cool before spooning over strawberries. With berries, the ladyfingers and sprinkling of cinnamon can be omitted. 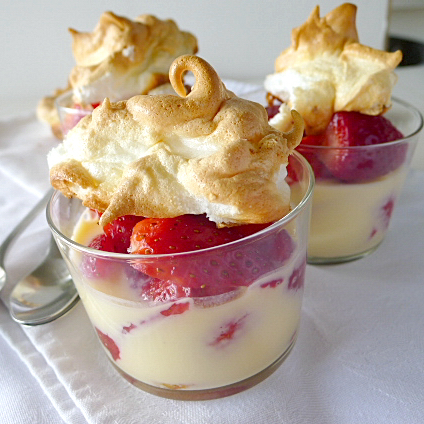 Fresh berries, custard and meringue topping--lovely dessert. Combine 2 cups milk, cinnamon stick, zest and sugar in a saucepan and bring to a boil. Remove from heat and strain into a heatproof bowl. Stir the remaining 1 cup milk with the cornstarch until smooth. Beat in 4 egg yolks. Whisk in the hot milk. Place the mixture in the top of a double boiler and cook over boiling water, stirring, until it is as thick as cream, 10 to 12 minutes. If using, place 2 sponge cookies, ladyfingers or plain cookies in each of 6 shallow pudding bowls. Spoon the custard over the tortas. Sprinkle with cinnamon. Chill the puddings. 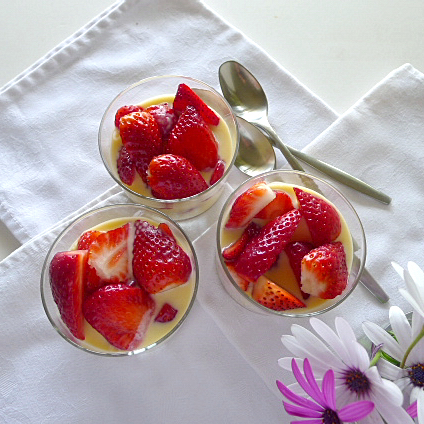 Or, if serving with fresh strawberries, allow the custard to cool, then spoon it over sliced berries. Preheat oven to 300ºF. Line a baking sheet with parchment. Place the egg whites in a mixing bowl and beat at high speed until stiff. Beat in the lemon juice. Add the sugar gradually and beat at high speed until combined. Heap 12 mounds of the meringue on the baking sheet. Bake until peaks are golden, 12 minutes. 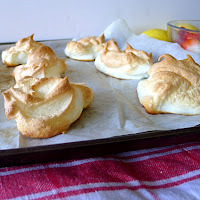 Turn off oven and allow the meringues to dry for 30 minutes. Classic natillas, sprinkled with cinnamon, served with cookies.